| Posts with tag "radio"
Yes, A Radiothon Still Works! On the surface, the concept of engaging in a full day Radiothon seems about smart as investing in a truckload of VHS units. After all, it’s 2018 and the entire world of terrestrial radio is losing a slugfest with Pandora, podcasts, and other “on demand” forms of music consumption. How on earth could a Radiothon still work as a successful fundraising concept in this era? It can and it does, with the intentional implementation of 3 key concepts: Partnership, Planning, and Prayer. Let’s explore the formula that has been working for 12 years to benefit Rescue Ministries of Mid-Michigan (R3M), a wonderful ministry that has been helping the hurting and homeless for 112 years. 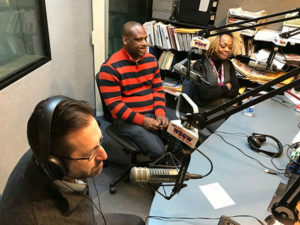 On Wednesday, December 13th, 2017, the most recent annual iteration of the “Sharing Hope Radiothon” aired for 13 hours across 5 Alpha Media radio stations (all housed in the same building), and the results were tremendous! Over the years of producing and leading Radiothons in various markets, there is a clear bedrock principle that must be honored – having a strong, committed, caring broadcast partner is the foundation for success. The radio station (or group) must treat and present your cause with sincerity, knowledge, personal involvement, and passion. For R3M, the partnership with the Alpha Media stations reaches far beyond the broadcast day. Throughout the year, the stations interact with the mission and help spread the word about unique needs and events. To its credit, R3M doesn’t just walk around all year with hands out asking for favors – they also invest a modest amount of marketing dollars back into the station during times of great need or special events. Over the course of the last dozen years, the stations have gone through multiple ownership changes. When that sort of turbulence occurs, it would be very easy for the Radiothon to be pushed aside and forgotten as important ownership and management transitions take place. 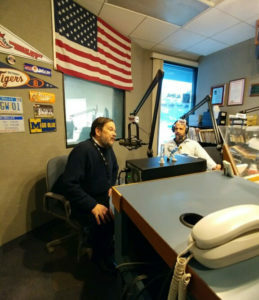 But, thanks to the true friendships built between R3M and the staff at the stations, the “Sharing Hope Radiothon” has become an annual fixture on the calendar. Not only that, but the core messages of faith, hope, and love based on the example of Christ is welcomed and celebrated across each of the 5 secular music/talk stations. There is no restriction of messaging whatsoever. That’s what being “truly invested” in the cause looks like. Radio – especially these days – is a turbulent business. Stations everywhere are fighting for survival. The easy answer for them would be to decline the takeover of a broadcast day on behalf of a charitable cause, or to attach an exorbitant fee to the point where the charity can’t afford to do it. Please know up front that finding the right partner is the most important step in building a successful Radiothon strategy. To further illustrate the importance of cultivating a relationship with the right broadcast partner, let me briefly share the story of a nightmarish Radiothon partnership from more than a dozen years ago. This scenario is (sadly) real, but the names have been changed to protect the victimized charity. 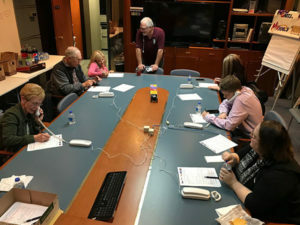 The Milwaukee Meltdown – The scene was familiar – a group of sister stations all residing within the same building was approached by a faith-based charity in town, with the goal of airing a full day Radiothon across the group of stations. To that point, though, there had been no other relationship between the charity and the stations. The charity had contacted the local Christian radio station and was quoted an obscene, shamefully high price tag…so the next stop was a secular, corporate-owned station group. This time the price tag quoted was, while still higher than recommended, something within the budgeted range for the charity. A contract was signed and plans put in place for the big day. Live guests were lined up. 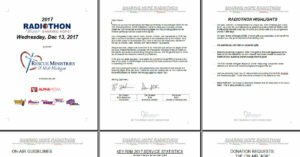 The broadcast day and key messages were scheduled. Station staff was given the outline of everything they would need to effectively communicate the importance of the day to their listeners. Volunteers were standing by in the phone bank to take donations from the audience. And the stations didn’t do any of it. What was supposed to be several minutes per hour of dedicated content became a few brief mentions, haphazardly thrown out with all the sincerity of a weather update. Live guests that had been served by the charity were brought to the station to share their stories, and never got on the air. The phones were silent. Voices were raised in protest of a severe breach of contract. The charity had been fleeced by a group of stations that was only in it for the payday. Friends, Radiothons can still work, but only with a trustworthy and fully-invested broadcast partner. Prepping the station staff – No one knows your charity better than you. Even a well-intentioned radio partner will invariably overlook some key aspects of what you do, the people you serve, and the core needs you have. The development of a full day “Playbook” is the best way to summarize everything from talking points to charity stats to specific on-air “ask” levels to hourly sponsors. The Playbook becomes the master guide throughout the day and eliminates confusion or ambiguity about on-air content. Certainly, there needs to be leadership present and on-air, but that should be done to buttress the credibility of the charity – not to share the specific stories of changed lives. Let’s put it this was – when was the last time you were deeply moved by a person telling you someone else’s story? 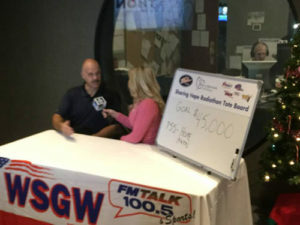 Business partnerships – Whatever your financial goals are for the broadcast day, you will need to raise at least 50% before the Radiothon goes on the air. Support from the business community will make or break your effort. Starting 60 days out, a dedicated effort must be made to secure sponsors for each hour, the phone bank, the tote board, matching challenges, title sponsorships, etc. Be creative. Unlike many charitable requests, this is a special time where you can actually provide direct, widespread exposure for the businesses that step up and support your cause. Cross-Platform Exposure – One of the most important aspects of the Radiothon for R3M is the involvement of the local CBS affiliate in providing coverage of the cause with live reports on various news programs. Having a TV news crew help launch and then conclude the day is a huge boost that brings in donations from those not listening to the radio. Most radio groups have partnerships with a local television outlet so this is a prime opportunity to take your message to another audience. Social/Web Engagement – Your most ardent supporters are part of your social media support system. They’re followers for a reason – they like you! So, make plans to keep them in the loop throughout the Radiothon broadcast with frequent photos, videos, tote board updates, and live streams from within the radio studios. Changed lives is the end goal! The key to this effort is to have your supporters sharing the content.Also key to the web element – have your online donation option easily accessible for first time visitors. For reasons of safety and convenience, many listeners will wait until they arrive at a destination before they donate. So, while they may have heard an especially touching story on the radio, it could be an hour or more before they take action by going to your website. It is your responsibility to ensure the ease of that donation route. While this is the final item listed, it is the most vital for faith-based causes. 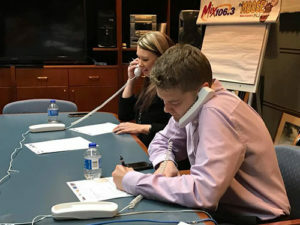 You’re embarking on a massive effort to do something the majority of the non-profit world thinks has run its course – raising support via Radiothon. You’ve planned every last aspect of the day, have your live testimonies schedule, sponsorships sold, stations ready to go. Don’t miss the most important element – commit the entire effort to the Lord. Ask Him to move in the hearts of listeners and prompt them to take action. It would be better for your organization to forego a Radiothon than to execute one poorly. There are layers and layers of elements that go into this unique effort. The process needs to begin no less than 6 months out from the broadcast date. For that matter, even the selection of the broadcast date is an important ingredient. If this is the first time your organization is considering a Radiothon, please contact Hobson Media for more information on how we can help your organization benefit from the exposure of a Radiothon. It can work for you! Why Launch A Podcast, Or Three? That question has a broad answer that applies to each of the shows we produce, as well as a specific reply that spring from the content of each unique program. Let’s start answering “why” we do this from the broader perspective. There has been a seismic shift in the level of patience among American consumers. This “I want it when I want it” mentality is on display in every spectrum of commerce and personal interaction. Fast food drive thru service has to operate at hyper speed if they want a satisfied customer. Try sitting at a light that has just turned green and see how long it takes before the driver behind you decides to lay on the horn and scold you for delaying their commute by an unforgivable 4 seconds. Everywhere you turn, someone is irritated at how long everything takes – even though technology has sped life up to blazing speeds already. Simply put, we are an impatient nation. An examination of your own changing habits for consuming news and entertainment will likely reveal a massive shift in how you watch or listen to pretty much everything. It’s far from a safe bet that you’ve even read this far in the blog, because we’ve crossed over the 300-word count. And yet, people still enjoy stories that touch their hearts, stir their emotions, and inspire them to take some form of action. That’s where podcasts come in. They provide an ideal solution to the consumer of content who refuses to be tethered to a specific airtime or program length. Podcasts allow us to tell a full story, truly connect the listener to the subject matter, and provide more than just “white noise” that occupies space but doesn’t touch a heart in any way. In a culture flooded with negative, tawdry, frightening headlines, the Big Impact Podcast shares positive, insightful, innovative, and inspiring stories each week. We’ve interviewed a double organ transplant recipient, the lead singer of a Grammy winning Christian group (Point of Grace), spoken to a doctor who volunteered to serve with Samaritan’s Purse in an Iraqi operating tent, sat down with THE man who literally invented arthroscopic surgery, and so many more. For those seeking uplifting stories of healing, hope, motivation, and encouragement, the Big Impact delivers every single week. The journey from “I do” to “till death do us part” is often a challenging one for couples of all ages. One look at the divorce rate in America and we’re reminded of the sad reality that many couples throw in the towel when things get tough. The Marriage Doctor Podcast is a weekly program featuring insights from a veteran licensed therapist and counselor named Terry Lodico. He and his wife share a practice, Covenant Counseling in Midland, MI, where thousands of couples have been helped over the past 20+ years. The program consists of a topical conversation each week, with Terry teaching basic concepts for improved communication, recovering from trauma, anger management, and a wide menu of other issues he’s addressed over the years of counseling. Listeners have been very encouraging with their feedback about the content of The Marriage Doctor, and our primary reason for producing the show is the hope that we can help foster healthy marriages in a culture that too quickly invites divorce. Nearly 20 years ago, we launched Michigan Golf Live (MGL) – a radio and television program focusing on golf destinations, tournaments, personalities, and equipment. While MGL will continue, it was time to launch a second program that carries a more national appeal (without a specific state in the title) and can run all year long. After asking for help from the social media audience that follows MGL, the creatively named Fore Golfers Network (FGN) was born. Now, each Monday morning, a new podcast episode is posted. In addition, FGN has a vibrant website with video and editorial content featuring travel reviews, equipment demonstrations, and much more. It’s become a fantastic destination site for golfers across the country. 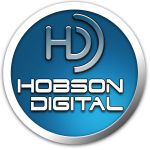 We’d love to have you listen to the Hobson Digital Podcasts and share your thoughts on the content. It’s a new age for media consumption and we’re proud to be leading the way in effective story telling!